Grab your boots and practice your “yeehaw” at Whispering Canyon Cafe. This hooping and hollering restaurant is loads of fun for the whole family. Before stepping into the restaurant you will hear the servers shouting and cheering from this open restaurant in the lodge at Disney’s Wilderness Lodge. Whispering Canyon Cafe is a great choice for families. The first sign of this starts at the restaurant check in with a table to play an old classic, Lincoln Logs. The kids can build and play while waiting for your table. This popular restaurant does take Advanced Dining Reservations. You may still have a few minutes for your table, so it is great to have an activity for the kids. This restaurant has a Native American and cowboy theme. You will find lots of wood and huge windows overlooking the woody areas of Disney’s Wilderness Lodge Resort. The chairs have Native American and cowboy art painted on the backs of the chairs. The artwork continues throughout the restaurant including on the ceiling with huge logs giving Whispering Canyon Cafe that same “lodge feel” as the rest of the resort. The huge chandeliers hanging from the ceiling bring in the western atmosphere with horses, cowboys, indians, and buffalo. Towards the back of the restaurant, you can even relax by a fireplace and enjoy your meal. The atmosphere is incredible, but the highlight of this restaurant is the funny servers. You cannot take anything seriously at this restaurant. When the servers greet you, they throw napkins on your table with a “howdy” shout out or remind you (in a very loud voice) to “wash your hands” as you head to the rest room. These servers may tease you, so be prepared! It does make for a rowdy and entertaining meal, but no one is off limits. Our server teased the adults and even the kids. My 7 year old, was taken to jail during our meal. This restaurant is fun, but be prepared to be teased. Some of the favorite ways the servers tease the guests including asking for additional Coca-Cola products (they will bring you a HUGE glass), asking for ketchup (they will bring you every ketchup bottle in the entire restaurant), or wearing Universal Studios or Sea World attire (that one really does not need a description). The servers are entertaining and you will get some great laughs during this meal. Whispering Canyon Cafe serves breakfast, lunch and dinner. My favorite meal is the BBQ dinner. The meal starts with several appetizer choices including BBQ Pork Spring Rolls, Smoked Trout Lettuce Wraps, Chicken and White Bean Soup, Western Chips and Dip, Mixed Green Salad, and Spinach and Butternut Squash Salad. The BBQ Pork Spring Rolls are pulled pork with cheddar, herbs, and BBQ Dipping Sauce. The Western Chips and Dip are a popular appetizer with homemade corn tortilla chips with bowl of fresh salsa and queso dip. For entrees, you can choose an a la carte menu or order the popular Canyon Skillet. The Canyon Skillet is an all-you- can-eat skillet served family style. 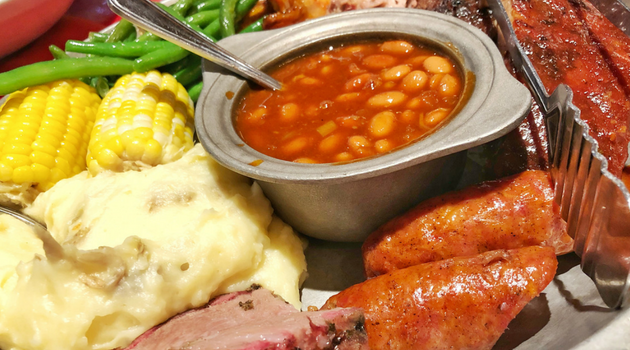 The skillet includes smoked pork ribs, pulled pork, oven-roasted chicken, beef brisket, mashed potatoes, cowboy beans, corn on the cob, mixed green salad, coleslaw, and fresh baked corn bread. The skillets are one cost for all of this amazing choices. Come hungry! After all of the amazing food, be sure to save room for dessert. Whispering Canyon Cafe features some incredible desserts including Kahlua Chocolate Cake, S’mores Cheesecake, No Sugar Added Berry Dome, Chocolate Caramel Bread Pudding, and Apple-Caramel Pie. 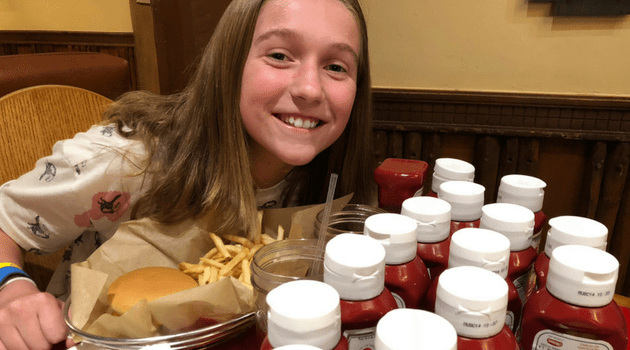 Whispering Canyon Cafe is a treat for the whole family. They feature great food in a fun atmosphere. This is a popular restaurant, so call 407-WDW- DINE or contact your travel agent to make an Advanced Dining Reservation. Try out the best BBQ at Disney World and a hooping hollering good time during your next visit to Disney. Our family loves BBQ! Whispering Canyon Cafe has a lot of BBQ options. I do not think it is the best BBQ in Orlando, but it is still good. Love the veggies and corn bread that comes along with many of the entrees. 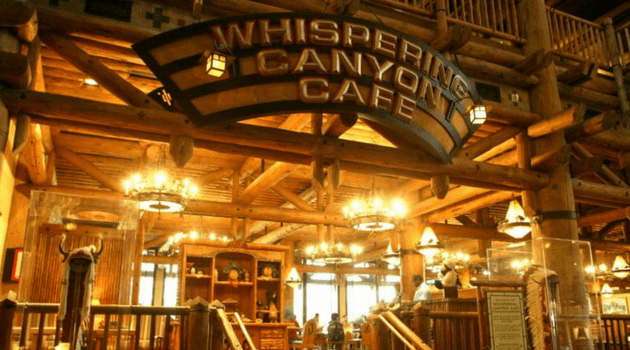 Our favorite part of Whispering Canyon Cafe is the atmosphere. It is just fun! Especially asking for the ketchup! LOL! Place all dry ingredients in mixing bowl and mix slowly for one minute. Blend milk, egg, and oil together. Slowly add step 2 to dry ingredients, while on slow speed. Don&#39;t over mix, only mix to incorporate product. Spray pan with a food release oil spray or line bottom of the pan with parchment paper. Pour batter in pan and bake at 350°F for 15 to 20 minutes or until bread is firm and golden brown. 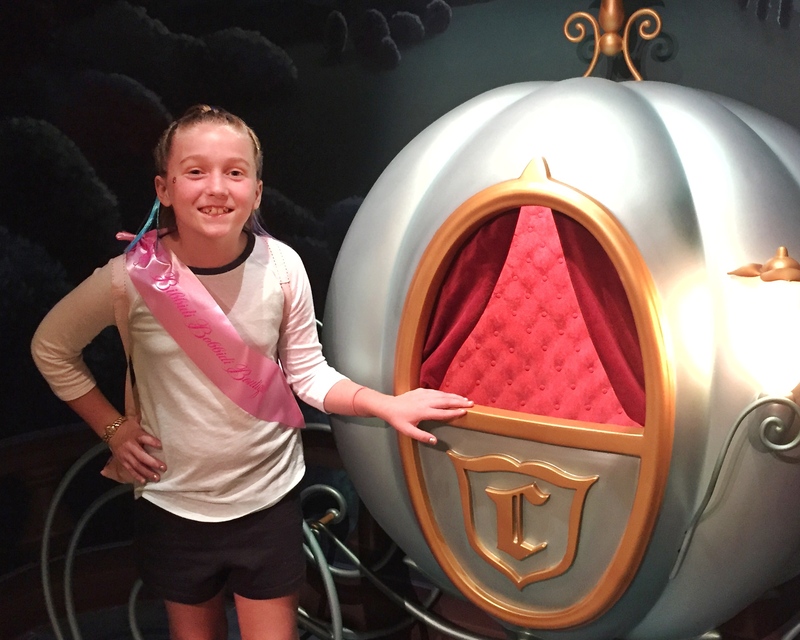 Enjoy some other articles about Disney World Dining! Disney Springs New Burger Restaurant!